Ida Mclaird's feet are turning to glass at a slow but alarming rate, and she has no idea why, or how to stop it. All she has to go on is a recommendation to see a myterious man named Henry Fuwa, a reclusive biologist whose life is devoted to caring for a species of "moth-winged bulls," which are exactly what they sound like – insect-sized bulls with wings. From Henry she visits another potential healer, Emiliana Stallows, who has reportedly cured another girl with Ida's condition. In the process of searching for help, Ida meets a young man named Midas Crook, a loner who was born and grew up on the islands of St. Hauda's Land. She falls in love, though he keeps pulling back, to my utter annoyance. Comparisons to Gabriel Garcia Marquez and Haruki Murakami pepper the professional reviews, but the writing is nowhere near that strong. Then again, few writers can hit those heights. But it is written above middling range, occasionally waxing purple, but usually not. In other words, I enjoyed it, and I can usually find something to pick apart when a writer fails to impress. A bit of over-wrought writing, when used very sparingly, I can handle. And that's the worst I can say about author Ali Shaw. The plot's addictive, the characters fully developed and absolutely wonderful, and though the overall tone of the story veers toward the morose it isn't unrelentingly so. A very imaginative story well told. Highly recommended, especially if you enjoy stories with a fairy tale flavor. I've already read a good amount of books this year, and all the ones I've finished have been remarkably good. Since time is limited – especially now I've started back writing my professional blog on behalf of the library – I may have to just zip over those in one quick pass. But this one I had to give a little extra attention. It's so unique and just plain deserves its own space. You can see my list of finished books on my sidebar. Considering it's the last day of January I have a pretty good count going. But I know I won't always maintain this pace, so don't get too awfully excited, tempting though that is. Also, sending a mass THANK YOU! for all the review books received so far this year. And apologies to Amazon for how far behind I am, which is sheerly pathetic. Churning out a review every two weeks for Library Journal is challenging (and I love that! ), and considering I asked for general nonfiction and professional (library) books – which are challenging, and most people won't touch them with a ten-foot pole – it takes much more concentration than your standard fiction book. Right now I'm reading a manual re: curating materials (think archives), which may sound dull to the general population but to me is anything but. Still, can't exactly just zip through a manual. 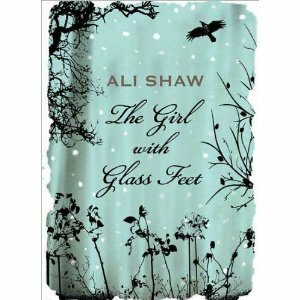 But do give The Girl with Glass Feet a try if you can. Even if you're not particularly into books with a tinge of fantasy this one's a great story. It doesn't go overboard, so those with general interest in literary fiction should enjoy it, too. I love this type of book, so this one sounds right up my alley. I’ve seen a mixed bag of reviews, but I still plan to snag it from the library and give it a try. Next Post Snow in Chicago? In winter? What a concept.